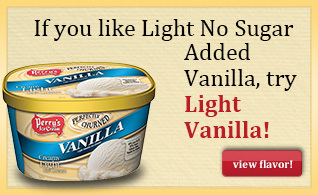 Anything but plain vanilla. 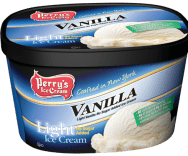 This rich and creamy no sugar added, light ice cream is a Perry’s classic. SKIM MILK, BUTTERMILK, CREAM, POLYDEXTROSE, MALTODEXTRIN, SORBITOL, MILK, WATER, NATURAL FLAVOR, PROPYLENE GLYCOL MONOESTERS, MONO- AND DIGLYCERIDES, CELLULOSE GUM, GUAR GUM, CARRAGEENAN, ANNATTO COLOR, SUCRALOSE, VITAMIN A PALMITATE, VITAMIN D.